The Pregnant Buffalo Lounge, a subterranean space at the Chopin Theatre, was home to the second WFMT Cabaret on Monday, January 23, 2017. A variety of performers gathered to warm audience members up with a live performance and broadcast on a chilly evening including folk group Foiled Again, actress McKenzie Chinn, vocalists Christine Mild and Alexis J. Roston, and pianist Vassily Primakov, a protégé of WFMT favorite Vera Gornastaeva. Doug Peck served as music director. Together, they presented a wide variety of genres of music from Ray Charles to Rachmaninoff, as well as spoken word. Being in the Chopin Theatre, Primakov had to share some works by the venue’s namesake compsoer. Below enjoy Primakov’s rendition of Chopin’s “Valse brilliante” in A Flat major, Op. 34, No. 1. Primakov, who was born in Moscow, Russia, also performed favorite works by Sergei Rachmaninoff. 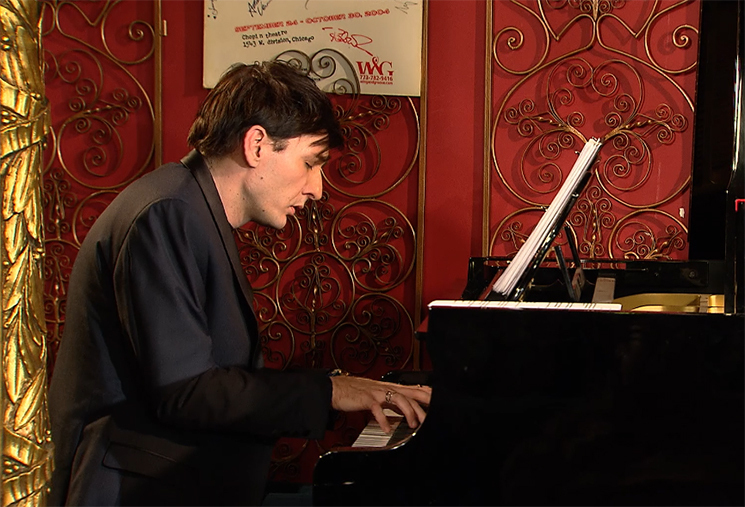 Watch his performance of Moments musicaux, Op. 16, No. 4 in E minor.